Over the past few years, the Halloween spirit hasn’t really taken me, which is odd because there was a time that I was a Halloween zealot. 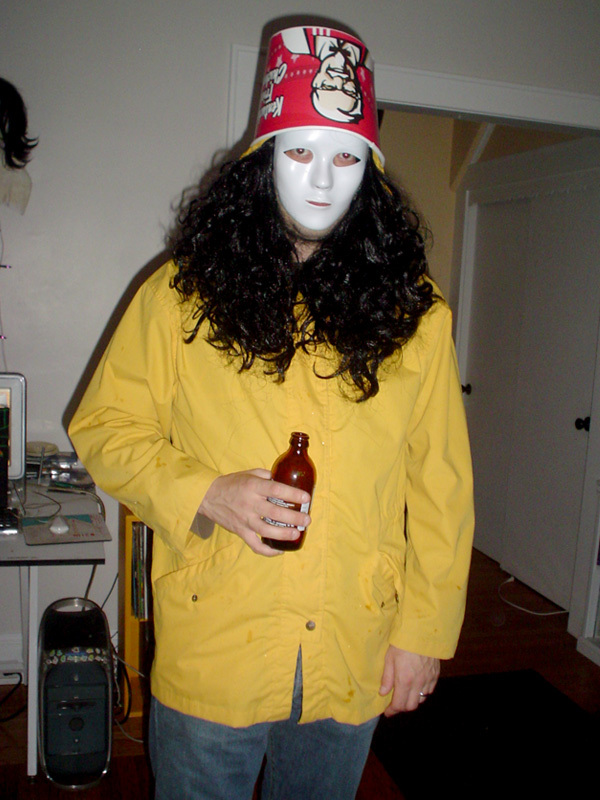 The last time I wore a costume was in 2007 when I dressed as Buckethead, the enigmatic guitar genius. Buckethead’s hair must be finger-licking good. Other than that, my only recent participation in Halloween has been the pact that I have with my wife to be the house that gives out full-sized candy bars. 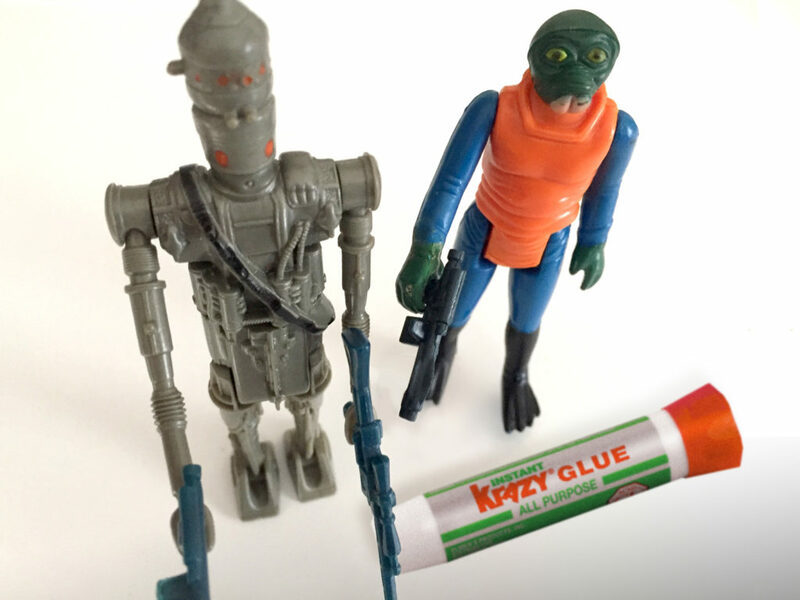 This is easy enough to do as we only get about five or six trick-or-treaters per year. 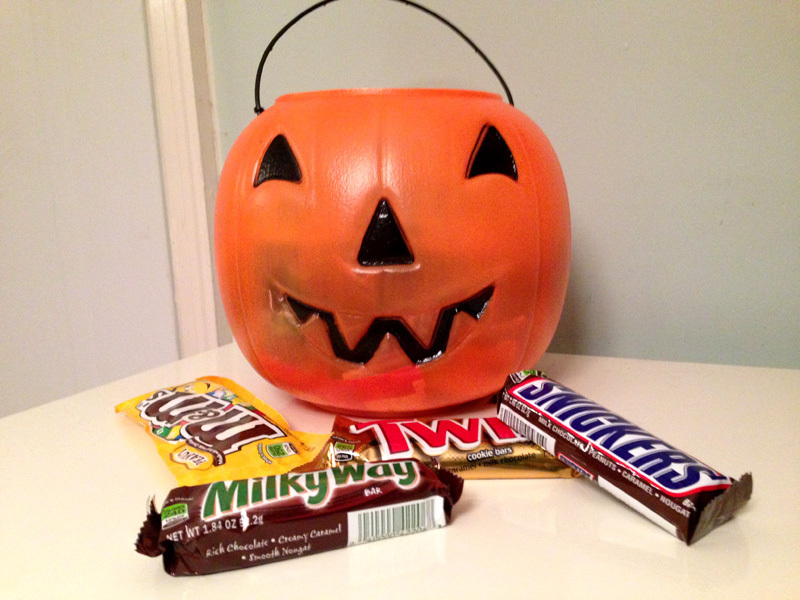 What’s not easy is resisting the temptation eat them all before the trick-or-treaters come around. This year I’ve been feeling a bit more Halloweenish It’s probably because I’ll be turning 40 next year and I find the idea of completely submitting to adulthood depressing. 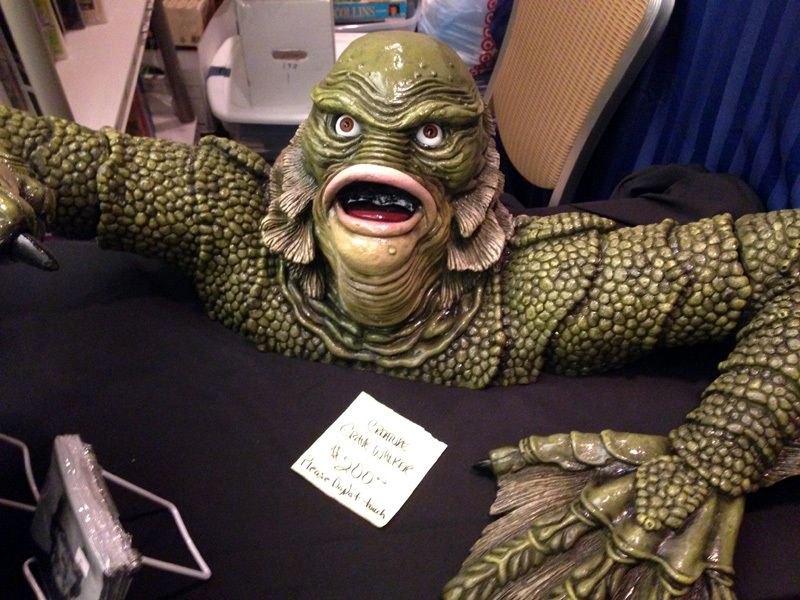 In the spirit of the season, my wife and I purchased tickets to the Chiller Theater Expo, a tri-state area horror and sci-fi convention held in Parsippany, New Jersey. 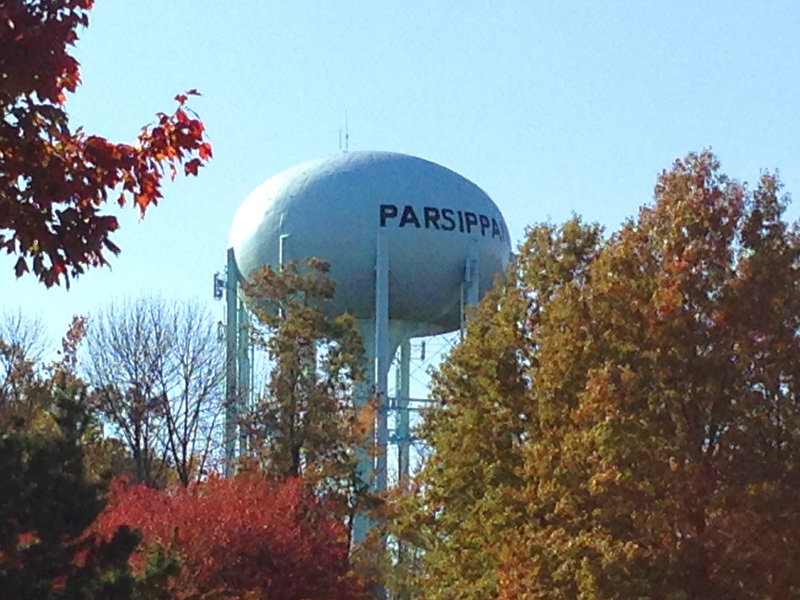 The ride into New Jersey was idyllic, a perfect autumn day, cloudless, sunny, and brisk, with the earthy smell of decaying leaves and burning wood in the air. 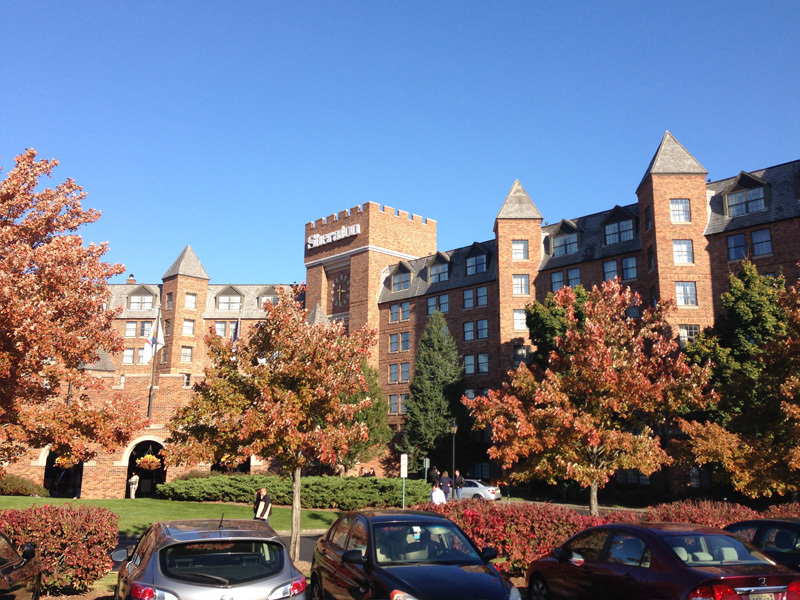 I was amused to find that the Sheraton hotel that hosts the convention looked a bit like a castle, which seemed appropriate. 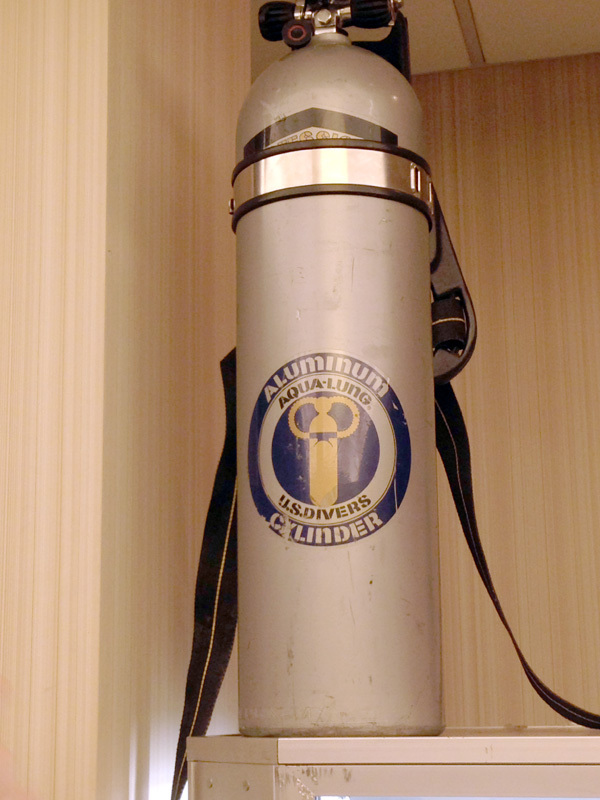 I had never been to The Chiller Expo, so I wasn’t sure what to expect. 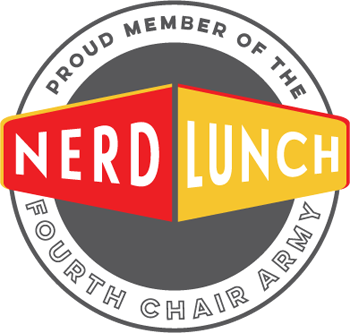 The website listed a wide array of celebrity guests like “Weird” Al Yankovic, Steve Gutenberg, Ace Frehley, Ralph Macchio and more, but I attend conventions less for the stargazing and more for the collectibles, exhibits, and panels. Having only one afternoon to experience the three-day expo, my focus was on the collectibles. Even if I’m not buying, I love browsing vintage toys, comic books, and magazines. 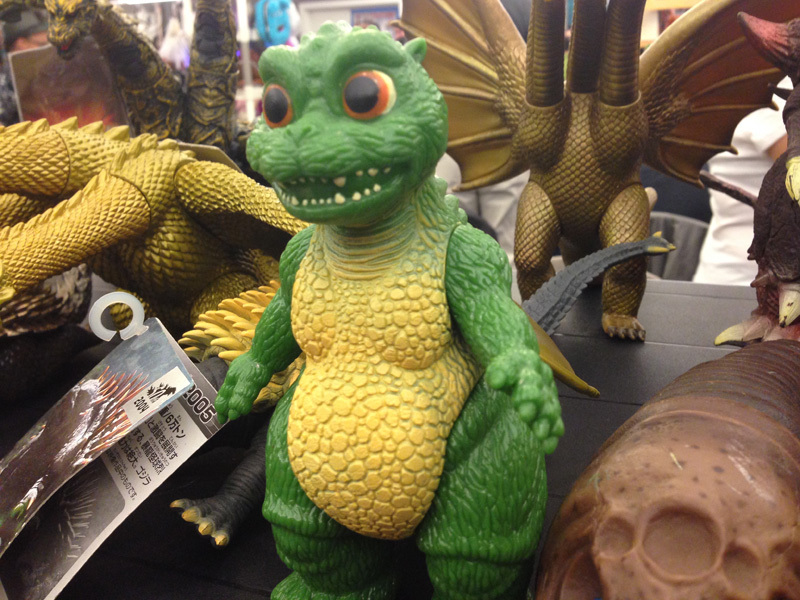 It was hard to not purchase the Bandai, Little Godzilla toy, but I was trying to exercise at least some self-control. However, I could not pass up the 1979 glow-in-the-dark 9″ Wolfman by Remco. The asking price was very reasonable compared to those on eBay, and I’m a sucker for things that glow-in-the-dark. 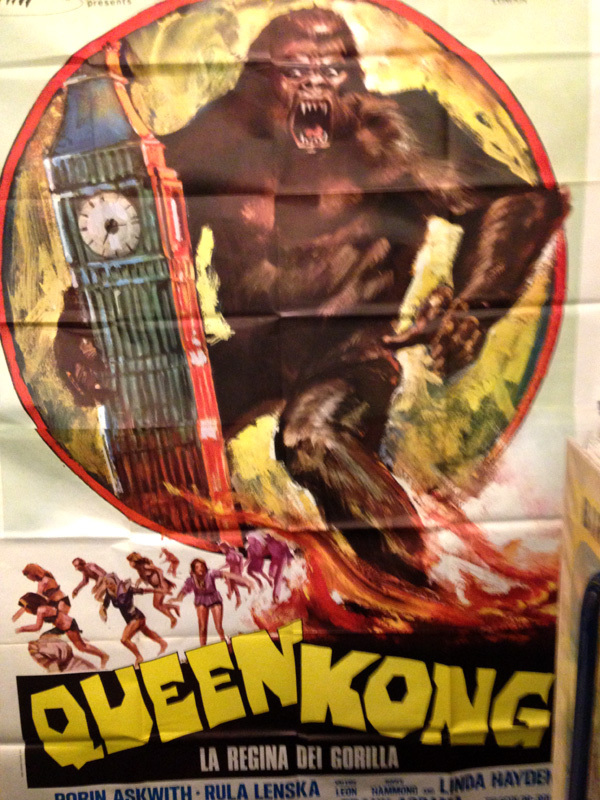 We browsed through rare vintage movie posters and lobby cards, and spotted a giant Queen Kong poster. Queen Kong is a 1976 British comedy that spoofs King Kong, gender swapping the ape and its love interest. Apparently it never saw a theatrical release due to copyright issues, but was later released on DVD. With that, a new movie is added to my watch list. 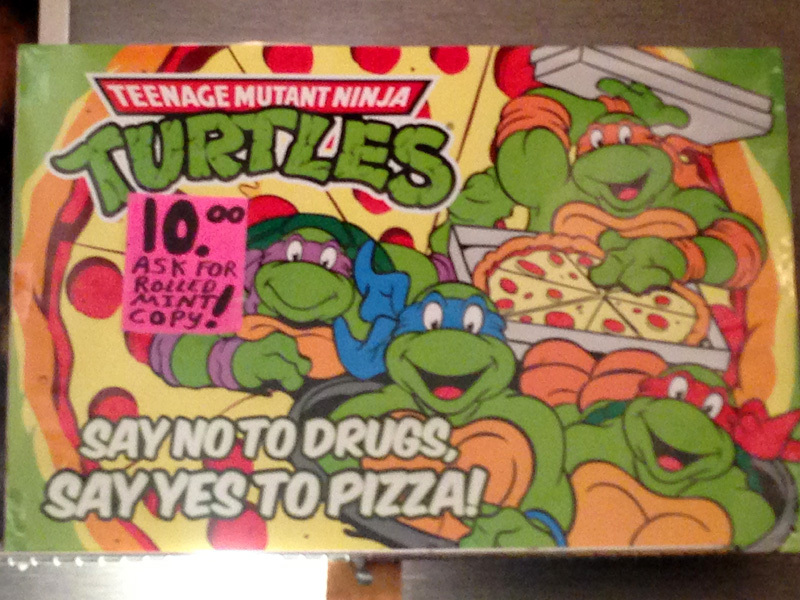 We also happened upon a very cool Ninja Turtles poster that offers an alternative to those struggling with the temptation of drugs. It reads “Say no to Drugs. Say Yes to Pizza!” I can’t argue with that. Perhaps Nancy Reagan’s Just Say No campaign might have been more successful had it been prepared to offer up such delicious options rather than empty platitudes. Say no to drugs. Say yes to Pizza! Sci-Fi and horror props, statues, and replicas were stationed at every turn. 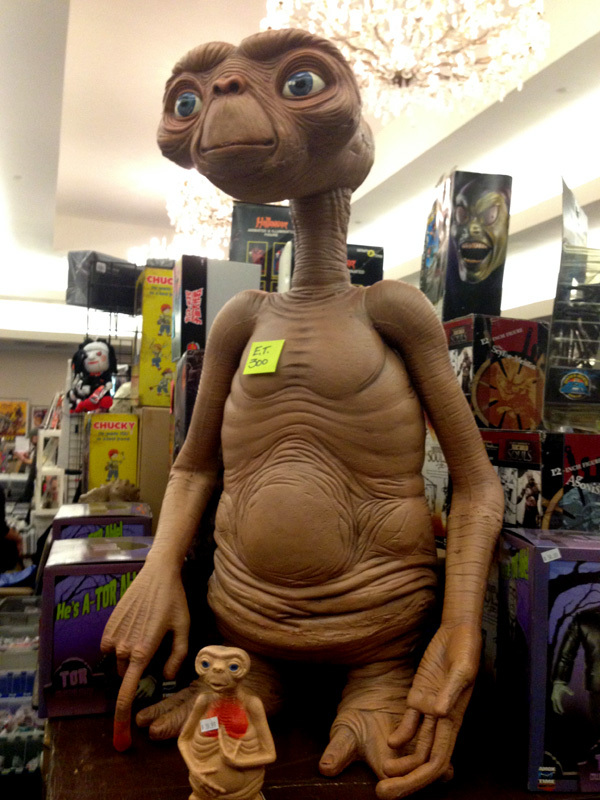 We saw a lifelike bust of Robert De Niro as Frankenstein’s monster, a towering statue of Pumpkinhead, E.T. 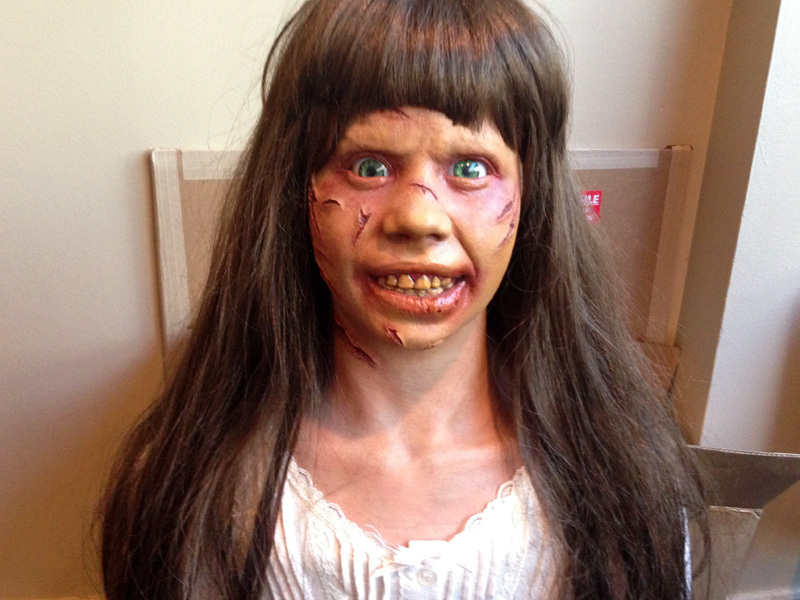 the Extra Terrestrial, The Creature from the Black Lagoon, and a seriously creepy Regan from The Exorcist. We did catch glimpses of some pop-culture celebrities like Brutus the Barber Beefcake of the former WWF, Robert Hays from Airplane, Zach Galligan from Gremlins, Tom Noonan from Manhunter and The Monster Squad, Michael Beck from The Warriors and Xanadu, and Corey Feldman from just about everything in the 80s. I always find the experience a little odd. It’s a strange “don’t I know you?” sensation that’s caused by the one-way familiarity. 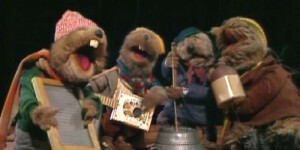 Somehow it all feels a little like looking at zoo captives. That being said it was very cool to meet a couple of cast members from A Christmas Story (a movie clearly synonymous with Halloween). My wife had her Randy action figure signed by Ian Petrella, the actor that portrayed him in the film. He was very gracious and personable and added ”oink oink” under his signature. This also offered me the opportunity to tell Zach Ward, who played the yellow-eyed Scut Farkus that I thought it a shame that his TV show Titus was so short-lived. Sure they’re just regular folk like the rest of us, it just so happens that they hand a hand in creating something that we love. 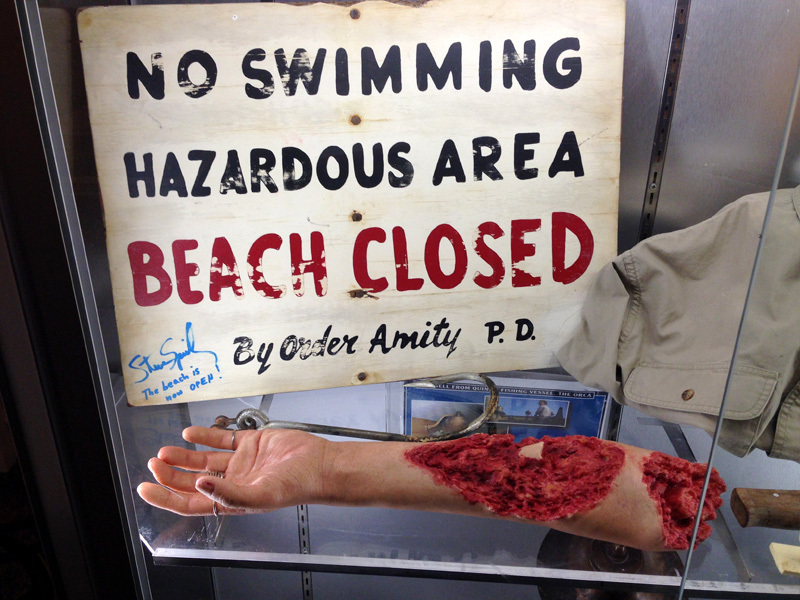 The real highlight of the expo was the Jaws exhibit which featured artifacts from the film. My wife and I are huge Jaws fans so this was an opportunity we couldn’t pass up. 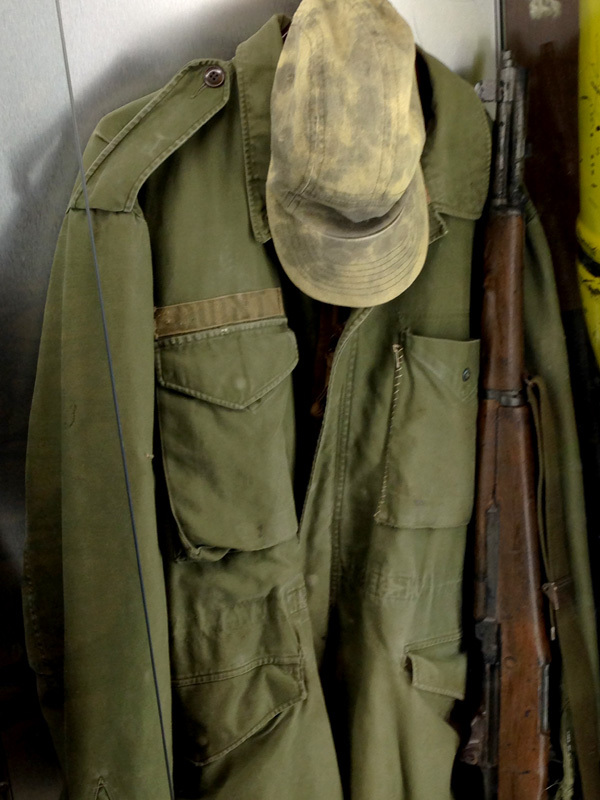 Included were select pieces of Quint and Hooper’s garb, Hooper’s spear gun, Quint’s rifle, and a life-size replica of the shark’s head. 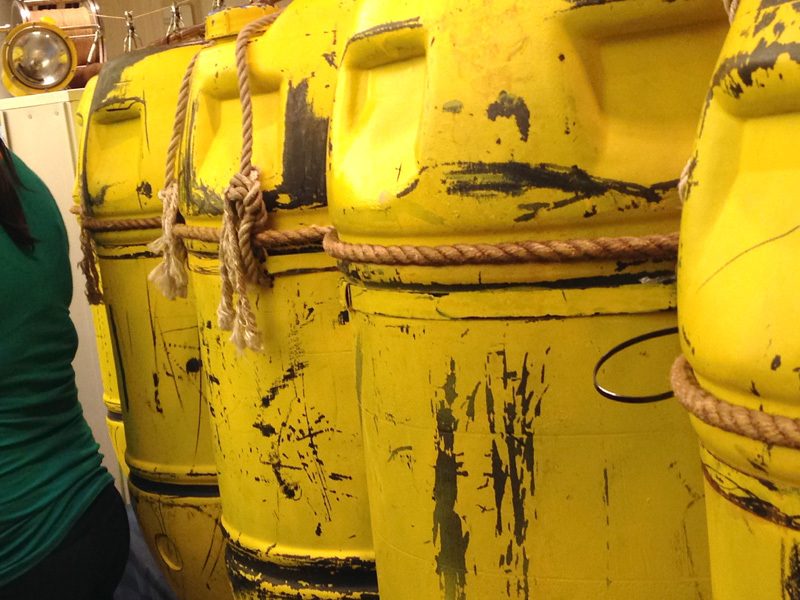 The barrels that were used to bring the shark to the surface were on display as well as one of the heroes of the film, Hooper’s oxygen tank. Smile you son of a…BOOM! Also on hand (pun intended) were the remains of the shark’s first victim, Chrissy, as well as Ben Gardener’s head, complete with a gaping eye socket. 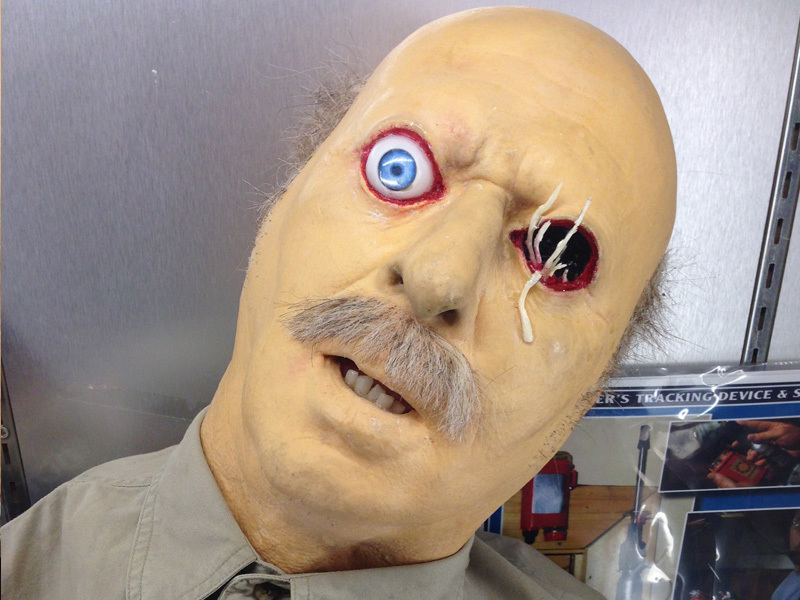 It was really interesting being face to face with a special effects prop that still has the ability to make me jump out of my skin even after countless viewings of the film. 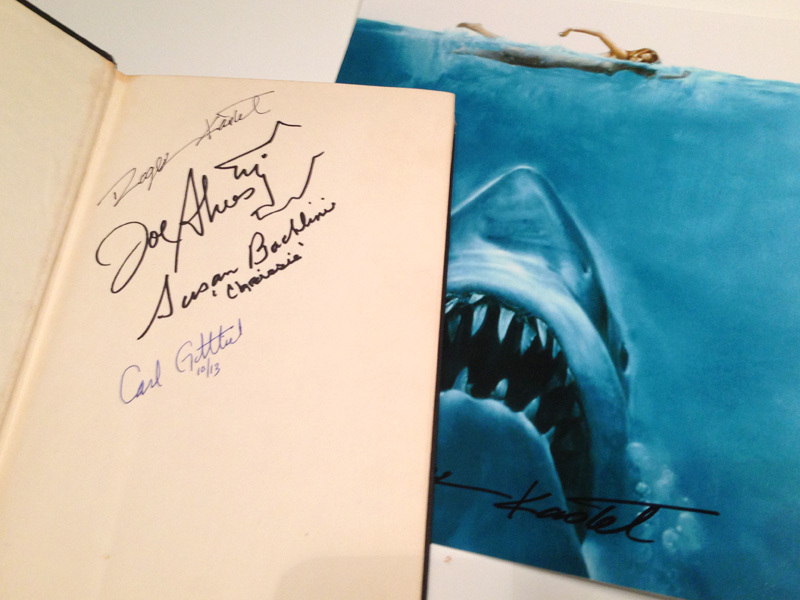 I brought along my first edition copy of Peter Benchley’s original book and was able have it by signed by Susan Backlinie, the actress who played Chrissie; Carl Gottlieb, who co-wrote the screenplay with Benchley and played Meadows in the film, Roger Kastel the brilliant artist behind the iconic poster; and Joe Alves, the production designer responsible for the overall look of the movie. Mr Alves and I had a great conversation, bonding over our shared Portuguese backgrounds. I couldn’t help feeling like a giddy fanboy. 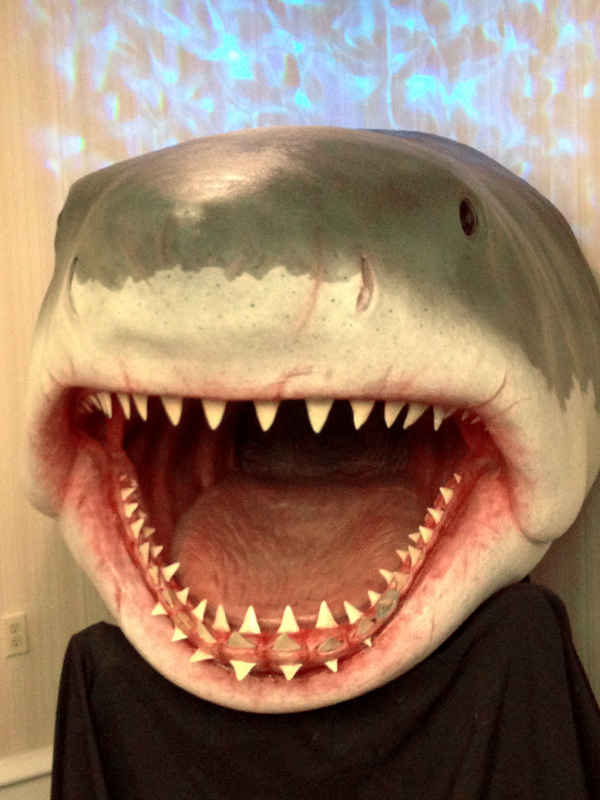 One thing that amused about the exhibit was a photo-op sign beckoning convention goers to “Take a photo with Jaws,” not “Take a photo with the shark from Jaws.” So is Jaws the shark’s character name, and Bruce is just the name of the mechanical shark who played him? I would certainly recommend the Chiller Theater expo for any pop-culture enthusiast. Even if you aren’t a big horror fan, there are enough other genres represented to make it enjoyable and it’s certainly a great way to get in the Halloween spirit. My wife described it best saying “it felt like being at a haunted flea market.” That sounds about right, and not a bad way to celebrate Halloween. On the way home, the Halloween mood continued when the mp3 player, set on random, appropriately offered up Nightmare on My Street by D.J. Jazzy Jeff and the Fresh Prince. On the way there, we passed a yard decorated with inflatable decorations that seem to be very popular these days. Personally, I can’t stand them. I find them garish and begging for a BB gun drive-by. 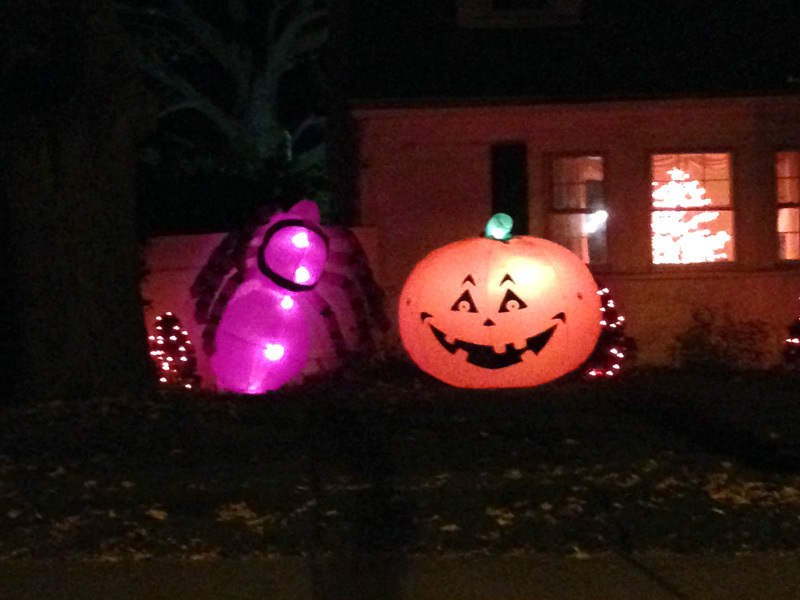 I feel compelled to pin notes to them that alerting the residents that parade floats are not Halloween decorations. 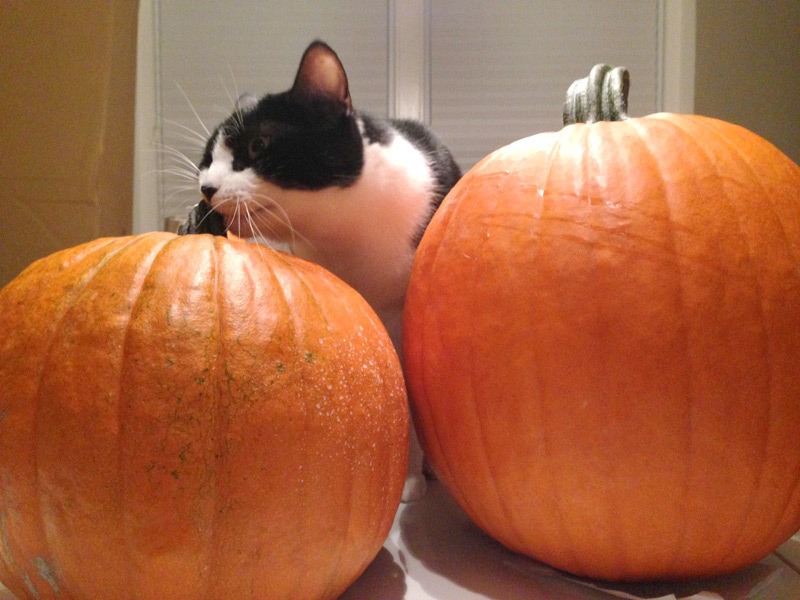 By now, feeling very Halloweenish, we stopped off at the grocery store to pick up some last-minute pumpkins. We do try to go pumpkin picking every year, but haven’t had the time to do so this year. 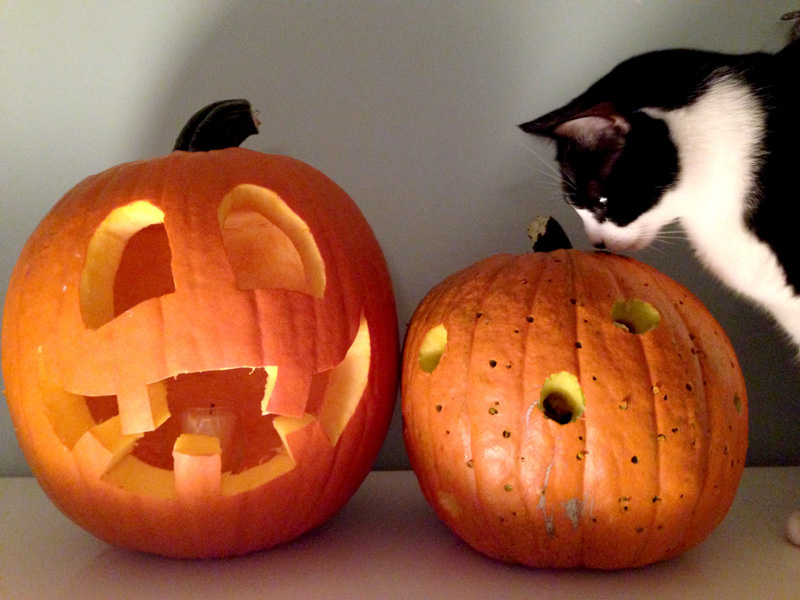 This time we actually carved the pumpkins, rather than setting them out on our stoop where they deflate by Christmas. 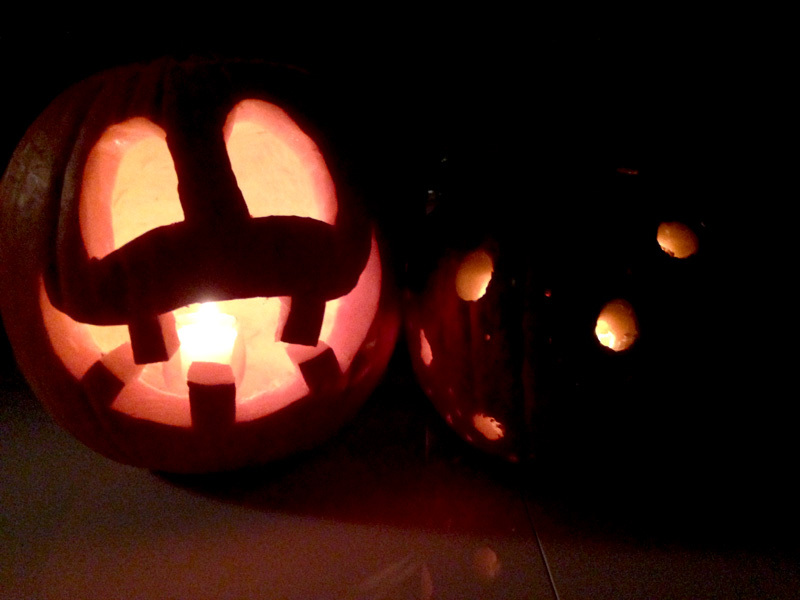 As we eviscerated our pumpkins my wife sang Dog Guts by the death metal band Macabre. Ah that old Halloween classic. My wife opted for a high-concept piece that looks to me like Charlie Brown’s ghost costume. I went for a cartoony looking jack-o-lantern. Sitting on the floor carving our pumpkins together was the perfect punctuation to the day. Nerd Out With Me grows his own pumpkins. Now that’s impressive. Cool & Collected spends a day at a huge fall festival. D.I. Treasures is drawing inspiration from the season. It’s a pretty fun. There was so much to see/do, but we really only targeted a few of our favorites. I’d say it’s worth going to even if you aren’t a horror fan. Thanks for the Fan Addicts head’s up. I dropped off after the first two episodes. I found them depressing. 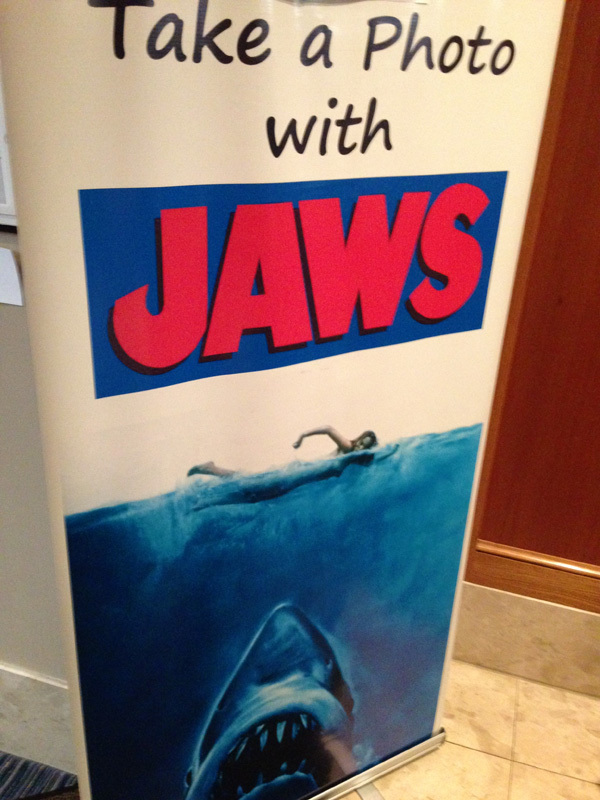 Though if it’s Jaws-centric, I’ll definitely check it out. I live in NJ and never even knew about this! I need to put this place on my calender for next year. And the Charlie Brown pumpkin is clever. LOL. I got into trouble for giving an older trick-or-treater dressed as Buckethead extra candy one year. I didn’t mind, it totally made my night! And he/she deserved the extra candy. 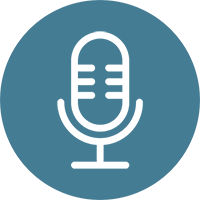 Great recap, I enjoyed reading it! I’m a lifelong Jersey guy and go to Chiller every time. 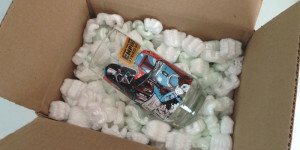 I have several Chiller recaps at my blog detailing all the junk that I brought home – I rarely have the kind of restraint that you demonstrated here! Glad to hear, thanks. I’ll have to check out your recaps. I look forward to this year’s Chiller.